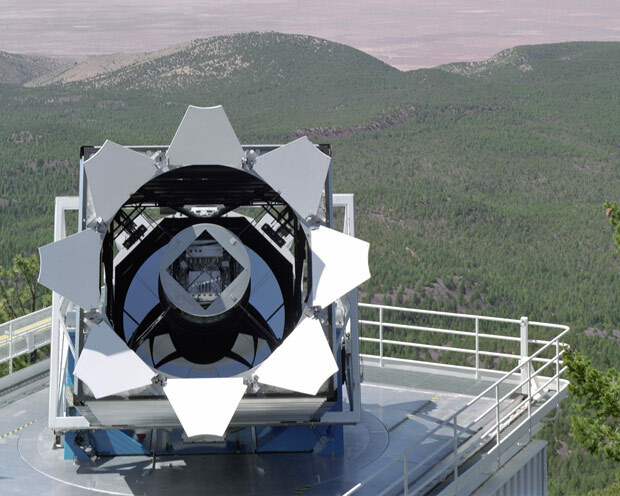 One of the first dark-energy experiments is underway at Apache Point Observatory in New Mexico, and project scientists have already reported some success. 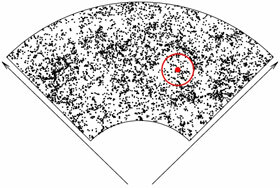 In 2005, they announced the detection of "ripples" in the way galaxies are distributed in the universe. These ripples were produced by sound waves soon after the Big Bang, and are a crucial bit of evidence in the effort to explain dark energy. The experiment is the Baryon Oscillation Spectroscopic Survey (BOSS), which is using the 2.5-meter (100-inch) Sloan Digital Sky Survey telescope. The original Sloan survey compiled the most detailed three-dimensional map to date of a large swath of the universe. It used bundles of digital fibers to observe more than one million galaxies. The data included each galaxy’s location on the sky and its distance from Earth. A team of astronomers used the observations of how galaxies are distributed through space to search for evidence of baryon acoustic oscillations. Observations of 46,000 luminous red galaxies, which are especially bright and red, across several billion light-years of space revealed a slight excess of galaxies that are 500 million light-years apart. This distance is like the crest in a ripple from a rock thrown into a still pond. As the universe expands, the size of these ripples should increase with it, so measuring the size of the ripples at different times will reveal how the expansion of the universe has changed. BOSS will expand on the earlier observations by studying 1.5 million galaxies over a much larger area of the sky. Project scientists will use the observations to plot the size of the ripples, which are like a basic yardstick for measuring the size and expansion of the universe, at three different times, ranging as far back as 10 billion years. Some observations with existing equipment are underway, with more extensive observations using enhanced spectrographs to commence in late 2009. BOSS should complete its work by 2014.